Description:Infects the foliage and crown, resulting in the yellowing off and dieback of the older leaves. Black hair-like fruiting bodies sprout in clusters on the leaves and sheaths of the plant. 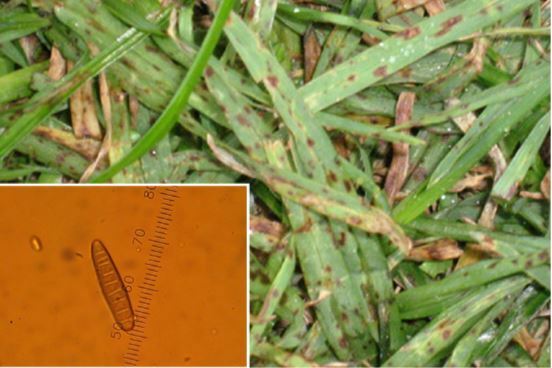 Host species: A wide range of turfgrass species,particularly damaging to wintergrass. Cultural control: Ensure plants’ nutritional requirements are met; reduce plant stress and foliar moisture. Description: Infects foliage, crown and roots, causing grey to brown lesions, crown rot and leaf death. 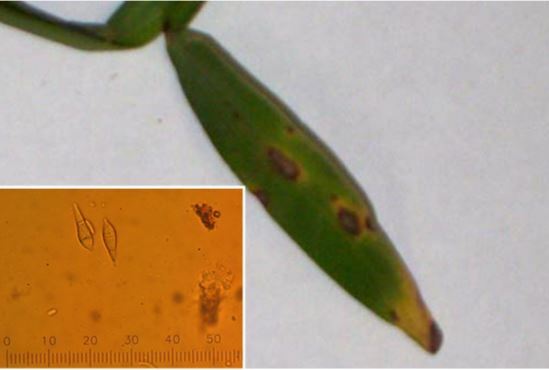 Infected plants can occur in small spots or patches. Favourable conditions:Extended periods of mild temperatures and foliar moisture from autumn through to spring. Host species: Primarily warm season turf species. Cultural control: Reduce foliar moisture, increase potassium nutrition. Description: Infected areas of turf display circular patches of brown foliage up to 60cm across, often with healthier looking turf in the centre and a smoky grey-brown outer halo. Symptoms vary between host species and conditions. Host species:Most turf species susceptible. 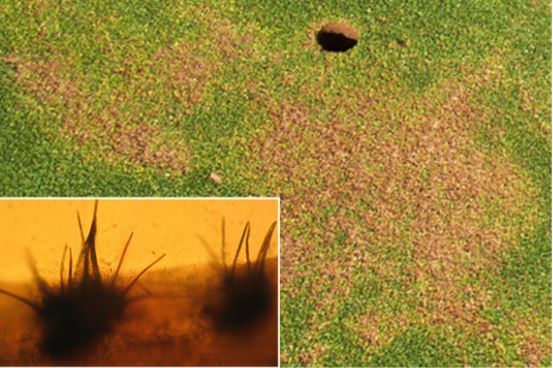 Cultural control: Avoid excessive plant available nitrogen, reduce foliar wetness and avoid excessive thatch. 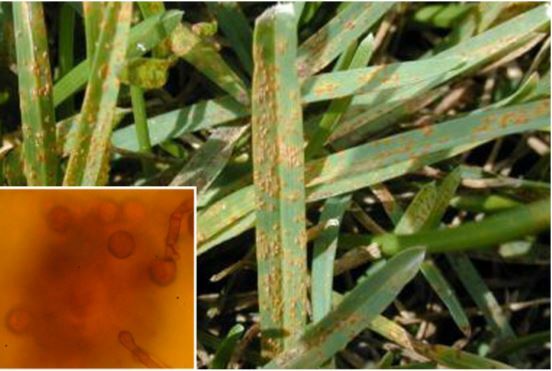 Description: Often found in infected turfgrass as a secondary infection. Lesions may appear on the leaf blade before the foliage dies and collapses. Infected swards can appear unthrifty and ‘speckly’. Favourable conditions: Extended periods of leaf wetness, physical and environmental stresses can contribute to disease severity. 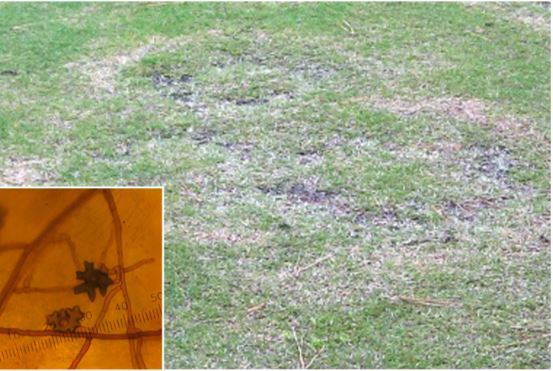 Host species: Infects most turf species. Cultural control: Reduce leaf wetness as spores are water dispersed. Description: Infected swards exhibit small, dollar sized deep sunken patches. 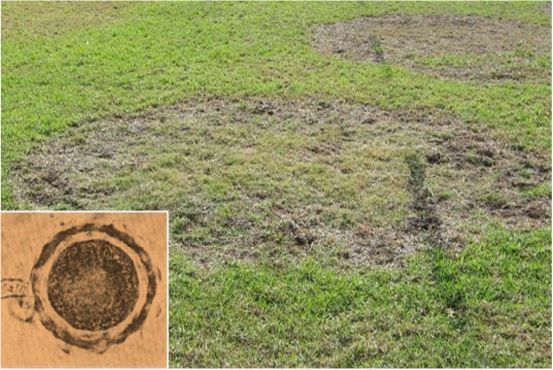 Patches can develop rapidly under optimum conditions and can destroy large areas of turf. 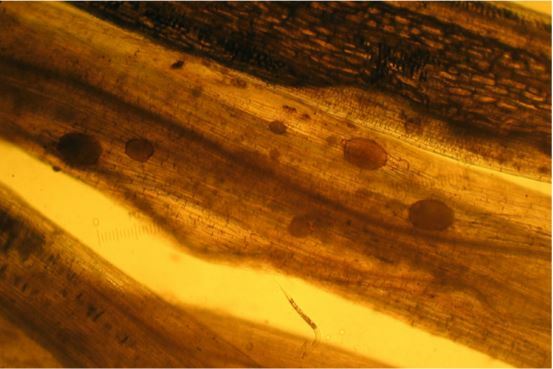 Hourglass shaped lesions can be observed across blades. Favourable conditions: Temperatures between 15- 30°C, excessive foliar moisture and low nitrogen can be conducive to disease development. Cultural control: Apply nitrogen, remove morning dew. Description: Infected turf becomes stunted with growth retarded to form broadened leaf blades. Yellow patches up to 10cm in diameter may form with the turf pulling easily from the soil due to a lack of roots. Favourable conditions: Humid, moist weather with extended periods of leaf wetness, occurring from cool to warm temperatures in various forms. Host species: Primarily cool season turf species. Description: Brown to purple lesions appear on the leaf blade and sheath, eventually turning to deep pitted necrosis in the plant tissue. 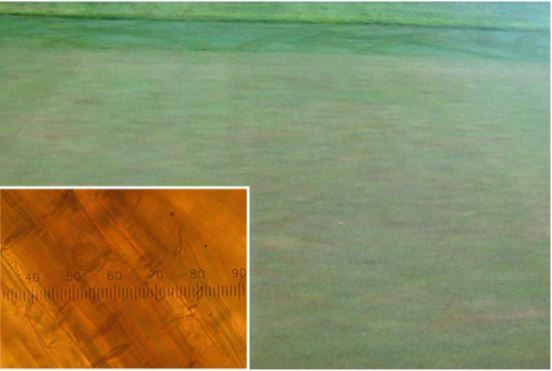 Blighting of leaves occurs as lesions grow resulting in thinning out of large areas of turf. Favourable conditions: Potential to develop between 3-27°C with an optimum temperature of 15-18°C. Host species: Most turf species are susceptible. Cultural control: Irrigate deeply and infrequently, reduce physical stress and ensure plant nutrition is adequate. 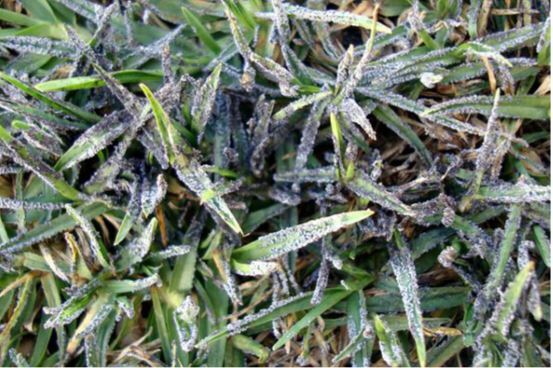 Description: Depending on the species, this disease may cause large rings of lush green growth to occur on infected turf, or may result in rings of mushrooms with plant dieback and hydrophobicity. Favourable conditions: The pathogen may be present throughout the year with symptoms being exhibited from spring through to autumn. Host species: All turf species susceptible. Cultural control: To mask symptoms, overcome hydrophobic soils with wetting agents, apply fertiliser to mask the rings and mow off mushrooms. 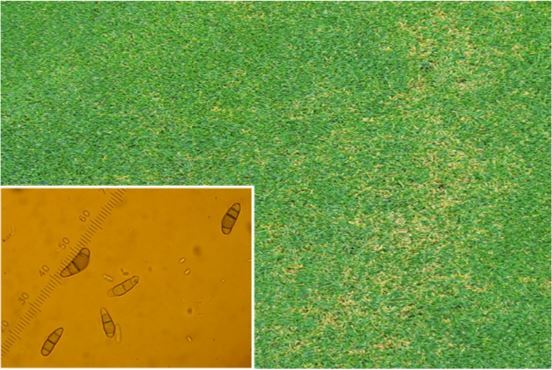 Description: This pathogen causes water soaked irregular shaped yellow to tan patches, often turning purple at the margins. 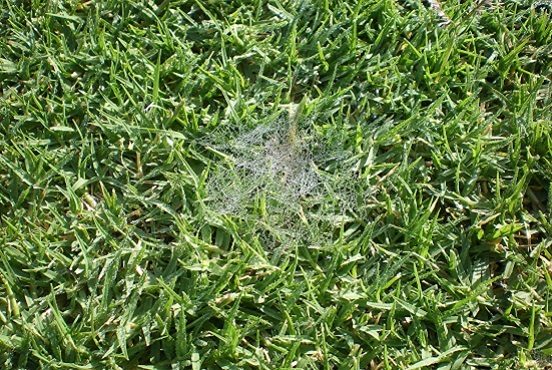 In moist, humid weather white to pink mycelium can sometimes be observed on the turf. Favourable conditions: Prevalent from autumn through to spring. Cultural control: Reduce turf stress and excessive growth. Description: In warm season host species this pathogen causes grey lesions with a dark brown margin. In cool season host species they appear as water soaked lesions, which quickly result in necrosis of tissue and blight. Favourable conditions: Warm humid weather with optimal temperatures of between 28-32°C. Host species: Most turf species, particularly Buffalo and Ryegrass. Cultural control: Reduce plant stress, avoid prolonged leaf wetness. Description: Patches appear in spring and summer ranging from 10 cm to over 1 m in diameter. Infected turf turns characteristically yellow and eventually dies back with weeds often colonising the centre of the patches. Favourable conditions: Warm temperatures during spring and summer. Cultural control: Mask symptoms with fertiliser applications. Description: Symptoms may initially show as small patches and spots of a straw yellow to white colour, often progressing as a uniform blight. On close inspection leaves will be dying back from the tip down to the base. Favourable conditions: Mderately warm humid weather. Host species: Most turf species particularly cool season varieties. Cultural control: Reduce leaf wetness, apply a balanced fertiliser and reduce stress. Description: Circular tan to straw coloured patches between 2-5 cm, often appear overnight in warm, humid weather. Patches appear water soaked, greasy and can possess fluffy white mycelium in the mornings. Spread rapidly blighting large areas of turf in a matter of hours. Favourable conditions: Hot and wet or humid weather between 30-35°C. Host species: All species susceptible. Cultural control: As the pathogen is spread by surface water, infrequent, deep irrigation is essential. Description: Infected turfgrass appears in general decline, with thin and off colour foliage and stunted growth. 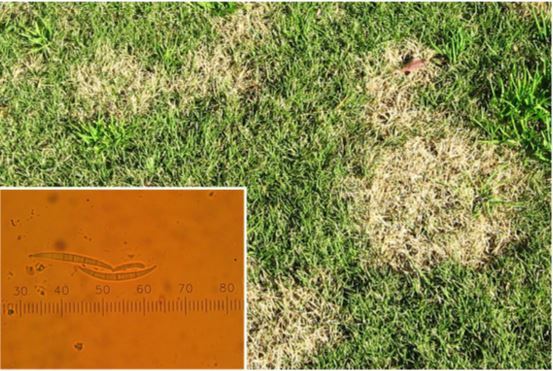 Symptoms appear as small yellow spots and patched eventually spreading to large irregular patches with this turf coverage. Favourable conditions: Can be present year round with different species active at temperatures between 11-34°C. Cultural control: Reduce general plant stress, particularly compaction and poor drainage. Description: Infected turf becomes blighted in small circles and patches at first, often spreading to destroy large areas. 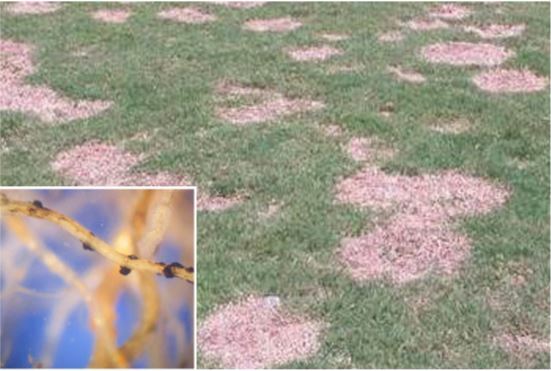 When conditions are ideal the pathogen produces bright pink threadlike structures called sclerotia that cover infected areas of turf. Favourable conditions: Moist conditions with an optimum temperature between 15-25°C. 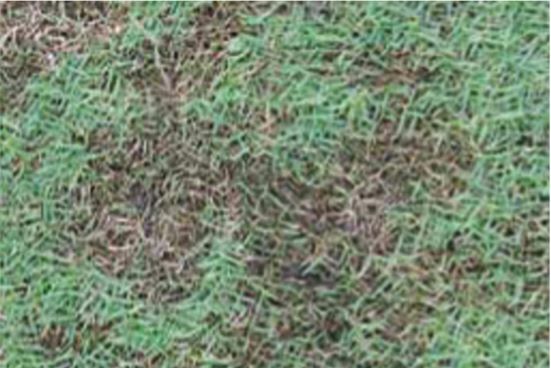 Host species: Most turfgrass species, particularly Ryegrass, Bentgrass and Fescue. Cultural control: Ensure adequate soil nutrition, mild applications of N may help. 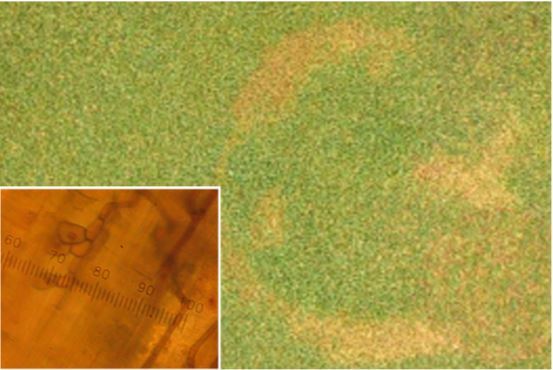 Description: This ERI pathogen initially exhibits symptoms as patches of chlorotic turf with stunted root system and poor foliar growth. 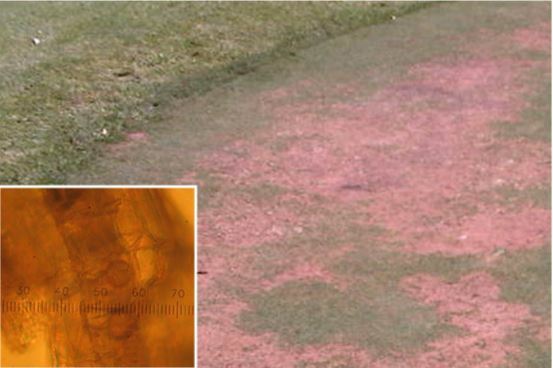 Infected areas become larger resulting in patches of thin or dead turf. Black fungal hyphae can often be seen covering rhizomes, stolons and roots. Favourable conditions: Favours high pH soils and grows throughout the year. Host species: Most warm season turf varieties, particularly Couch Grass (including cultivars). Cultural control: Ensure adequate nutrition (particularly N, K and TE) and reduce plant stress. Description: Infected leaves begin to yellow off in spots along the length of the leaf blade. As the infection progresses pustules of orange spores protrude from infected leaf tissue and burst resulting in masses of rust coloured spores over the leaf surface. 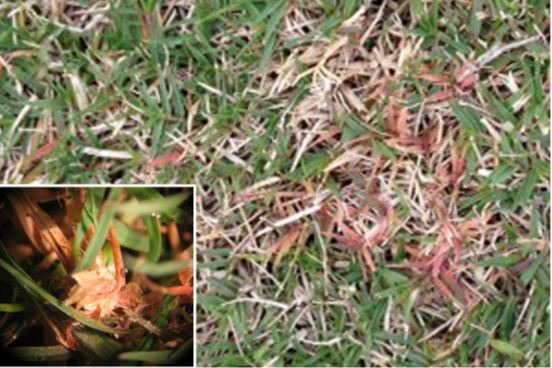 Large areas of turf can become infected, turning whole swards orange. Favourable conditions: Optimum temperatures between 20-30°C. 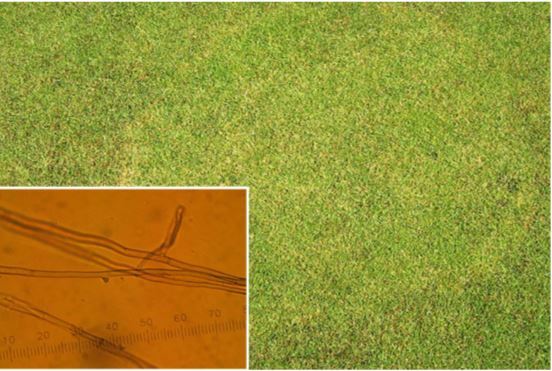 Host species: All turfgrass species are susceptible. Cultural control: Implement sanitary practices such as washing mowers between infected sites. 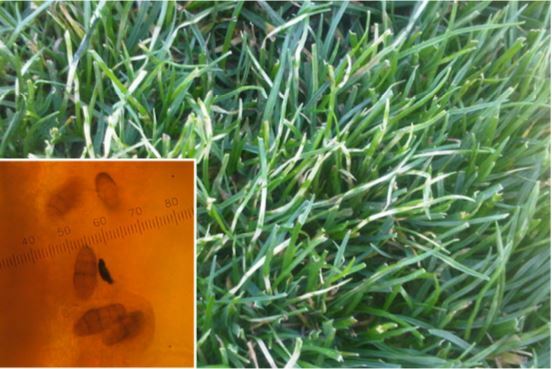 Description: These organisms are not plant parasitic and do not cause disease in turfgrass, however their presence impacts on aesthetics and playability of turfgrass surfaces. 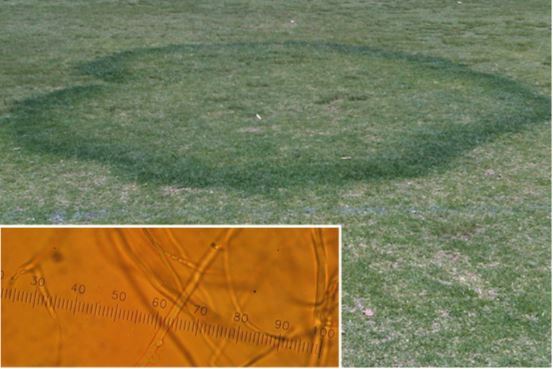 Large numbers of tiny fruiting bodies appear on turfgrass in white, yellow, brown or grey patches and rings giving turf leaves in a mouldy appearance. Favourable conditions: Cool humid weather favours development. Cultural control: Reduce thatch as it provides a food source to. Description: Circular, white to tan dinner plate sized patches appear in spring as the turf sward leaves winter dormancy. Through autumn and winter root tissue it affected by the pathogen. Roots and stolons appear rotted and blackened in affected areas. Favourable conditions: Optimum temperature is 15°C when pathogen growth is strong and host root growth is slow. Host species: Common Couch and Couch hybrids. Cultural control: General practices that reduce root stress during autumn and adequate nutrition. Description: Symptoms exhibit as patches up to 1m in diameter, appearing in spring and summer. The affected turfgrass dies back slowly as the patch enlarges, coalescing to form large areas of dead turf. As the disease advances the centre of the patch can be colonised with non- susceptible species. Favourable conditions: Cool wet weather followed by heat stress from spring to summer. Host species: Cool season species, mainly Bentgrass. Cultural control: Maintain soil pH below 6.5 and ensure adequate trace element nutrition (mainly Mn).